When it comes to bringing innovative products to market, Google is unstoppable. In Google Labs there now are two new tools available that are in beta-test mode currently. They are focused on the fast food market: Google MeatView and Google FatWords. Because of current market stability overseas, Google has already pioneered these services in Europe, especially Germany, and will be rolling them out in the US over the next weeks. Our German staff (all devout meat eaters) had the opportunity to test both services in great detail. Even Google understands that meat doesn’t just equal meat. Especially some of the most recent food industry scandals have made the strategists in Mountain View listen up and take these concerns very seriously. 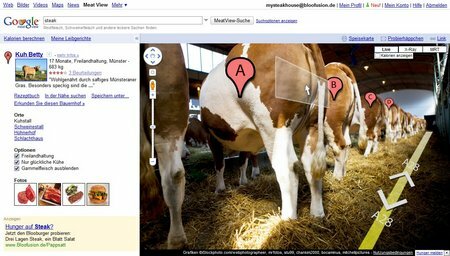 Google is using MeatView to offer an insight into stables and pastures. In the near future, the purchaser of a hamburger or steak will have access to a so-called QR-code stamped right on the packaging material. With this code you will be able to determine the source of the cut. And vice versa, you will be able to go online and select a specific animal with the ability to drill down to more detailed information, i.e. date of birth, current weight, etc. Particularly useful are the various data points and options here. For example, you can search for “happy cows” or specifically exclude low quality cuts. At this point there is a definite lack of organic meat selections, but Mountain View indicated that this feature will be rolled out in the next release. As the fast food industry is struggling with its current image, Google believes it can improve things taking advantage of a brand new advertising space that has been ignored up to now. Google has initiated an ad program called Google FatWords – this is in beta as well. Select clients can access it directly via the AdWords interface. 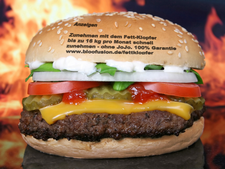 By using a unique technology ads can be branded directly onto a hamburger bun without a negative impact on the taste. What’s even more impressive is that these ads are context-sensitive, i.e. a family having Sunday dinner would see something completely different than an individual teenager ordering a fast-food treat on the way to the roller skating rink. A lot of research and development will be needed here, but in Google’s eyes that’s justified because of the attractiveness of the potential target market. Google is entering a brand new marketing ecosystem with MeatView and FatView. We think these services look extremely promising although a lot of details need to be worked out before they can are ready for the broader public. At the end of the day, the consumer has to understand the ramifications of too much information with the MeatView service. After all, do you really want to know where and how the cow was raised that is now on the plate in front of you? One of the side effects of MeatView could be decrease of meat consumption, but only time will tell. FatWords is definitely an interesting tool. And once the hiccups have been ironed out it will represent yet another avenue for advertisers to tie together the online and the offline worlds. Awesome…I needed a good laugh today. Very creative, Andreas! Very nice, Andreas! Love Google with the burger in it. I can’t wait to see the Google View of exactly where my steak came from on that cow…or for that matter the part they make the hamburger out of. I’m thinking the GoogleSausageView will probably be too revealing. First, good article, this material has a lot of food for thought.Google is really cooking up great ideas to feed this market niche. I’ll eventually get beyond the bovine privacy issues, but will it pass mustard with the vegitarians? Agreed. I don’t think Google will be vying for the Santa Cruzes of the world to launch these a-mooooo-sing products. Then again, if they prove to be cow-st effective and render some finger-lickin’ ROI, there might be a change of heart. 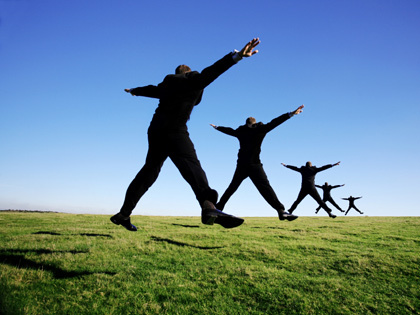 Next post: Google Instant Search: The sky is falling or much ado about nothing?